The family environment has a primary influence in the development of food habits. Parents and siblings have a significant impact on the child's habits. It's the duty of parents to provide children with a proper balanced diet, and also give them the chance to choose healthy foods. As new parents, we are all aware of the importance of good nutrition as a child goes from infancy to adolescence. Growing children need more healthy nutritious food in proportion to their size as compared to adults as they are developing teeth, bones and muscles, to eliminate onset of diseases as well. There are several risks when your child does not receive enough nutrition. According to Global Alliances for Improved Nutrition (GAIN), for nearly 2.6 million children worldwide, malnutrition is the underlying cause of death every year. Malnutrition can create obstacles in a child’s momentum of growth, leaving both his height and weight well under expected levels, as compared to normal children. This is a consequence of severe protein deficiency and energy deficiency in children, where they suffer from consequences like massive weight loss, water retention, bloated belly, etc; if not treated, this can lead to death. Malnutrition and eating disorders occur when your child displays poor appetite for a long period, has a limited diet or foods with not enough nutrients. The following can also be major signs that your child is developing malnutrition. 1. Change in the balance of electrolytes in the blood. 2. Changes in behaviour, being slow, usually irritable and moody. 3. Developing infections frequently due to a poor immune system . 5. Bruising and broken bones. Let us look at the specific nutrients necessary for your child’s desirable growth and development. Proteins are made of amino-acids that are essential to boost your child’s energy. Little protein or excess protein and carbohydrates can change the composition of your child’s body. Energy requirements in children are dependent on the basal metabolism. The rate of growth and energy must be adequate to spare protein from being used for energy. At the same time, care should be taken that excess weight gain is avoided. 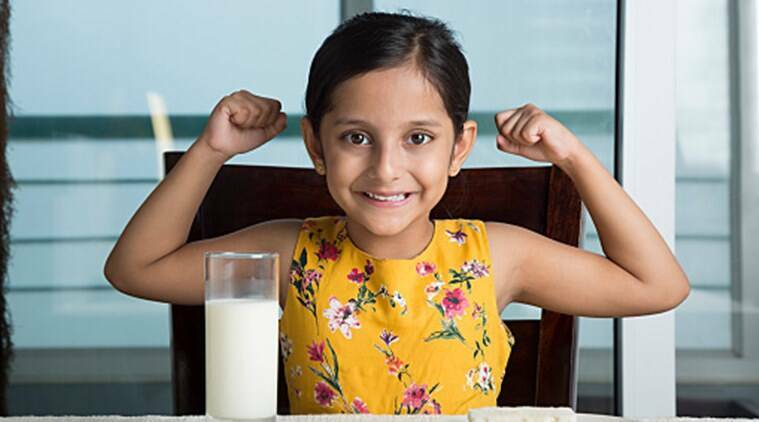 The proportion of macro nutrients for kids is 65 per cent carbohydrates, 30 to 40 per cent of fat and 5 to 20 per cent as protein. It is crucial for parents to be aware of this basic protein requirement for their child. Protein deficiency is usually observed in those on a vegan diet, kids with food allergies, fad diets, and inadequate access to food. Minerals and vitamins are an important source for normal and healthy growth. Iron, calcium and zinc are important for blood and bone health, and Vitamin D for calcium absorption. Besides, there must be sufficient water intake to avoid stomach bloating and inflammation. Vitamin E consumption alleviates bacterial infections and gives your child healthy skin. Vitamin C is important for boosting immunity in children. With these basic facts and knowledge, let us see how we can design our parenting to have a positive impact on our child’s nutrition and lifestyle habits. Factors that influence a child’s food habits include their personal preferences, as well as parental influences, media, social trends, peer pressure, illness or disease. The family environment has a primary influence in the development of food habits. Parents and siblings have a significant impact on the child’s habits. It’s the duty of parents to provide children with a proper balanced diet, and also give them the chance to choose healthy foods. Family meals are an excellent way to cultivate healthy habits in children. They pick up healthy habits, like eating a fruit or veggies and wholesome eating from parents at home. It has been found that children who eat with families do better in schools, have less eating disorders, are less likely to get in to drug abuse and more likely to have a better peer relationship. 1. Try and maintain a schedule by fixing timings for food and sleep. Kids are happier when they know what to expect when. Also, kids don’t eat well when they are tired, so planning activities and meal times are essential. 2. Avoid processed food and sodas. Get them to drink water and milk, which accelerates nutritional growth. Even canned juices are not a great idea. As far as possible, whole foods are the ideal choice. The excess carbohydrates found in juices contribute to obesity and excess sodium in processed foods to increased blood pressure. DASH diets (Dietary approaches to stop hypertension) are useful at any age. 3. Don’t pressurise them too much to finish the food on the plate. Kids don’t usually eat when they are full. Let them decide when to stop. This will possibly prevent them from becoming overweight. 4. Limit TV time, as parents and for kids. Avoid screen time and spend on activities like fun and intellectual games and outdoor games. Kids particularly like to watch TV while eating and do not realise what and how much they are eating; over a period of time this may become a mindless process and cause obesity. So, avoiding TV while eating right from the beginning it is a good idea. 5. Let kids experiment with varieties of foods, consciously avoiding their exposure to junk food, or processed foods as far as possible. But avoiding junk foods completely is never a good idea; limit it to once a week (for children aged 4 to 15 years). 6. When kids are kept in day care centres, parents should investigate what kind of food is being supplied. Take care to serve small portions and set the meal properly. Children’s feet should be supported well, the crockery should be child-friendly and unbreakable.